Startups? Check. Nonprofits? Check. Ten years after the ICE program began, students have made entrepreneurship and social enterprise the biggest minor on campus. Wake Forest has an app for that — the more traditional kind, one that allows a student to apply for a seed grant to start a business or nonprofit venture. This is just one tool in the decidedly nontraditional Innovation, Creativity and Entrepreneurship (ICE) program, which is celebrating its 10th year of infusing the liberal arts with the practice of getting things done. The results include 168 funded ventures by fall 2014, more than 50 new courses and untold numbers of students, alumni, faculty, businesses and nonprofits inspired and informed by ICE, known until 2010 as the Office of Entrepreneurship in the Liberal Arts. “We were entrepreneurial before it was cool, but now it’s cool, and everybody’s doing it,” said Bill Conner, faculty director for ICE, a biology professor and Lelia and David Farr Professor of Innovation, Creativity and Entrepreneurship. True to ICE’s culture of “why not,” its administrators and instructors are multitasking like crazy helping students and faculty turn ideas into reality. The program started in 2004 with a $2.18 million grant from the Kauffman Foundation and matching funds for a total of $5.9 million. It marries academic offerings with an ICE center in Reynolda Hall that acts as a hub for experiential learning, advice, resources, collaboration and outreach. Over the years ICE has modeled its own version of entrepreneurship, expanding to touch nearly every academic sphere, from the business school to departments of philosophy, studio art, communication and biology, to name but a few, and has won numerous national awards. It reaches into local and national communities with student- and faculty-inspired businesses and nonprofits, internships, endowments, mentoring, conferences, competitions and fellowships. An ICE project led to the annual TEDx conference at Wake Forest, which began in 2012 and draws more than 1,000 attendees to hear innovative speakers. The program includes the most popular minor on campus — entrepreneurship and social enterprise — which had 288 students by the spring of 2014. ICE’s leaders say ICE remains a national rarity in its foundation in the liberal arts college; most entrepreneurship programs still operate out of business schools. The success stories over the past decade are numerous — and impressive. 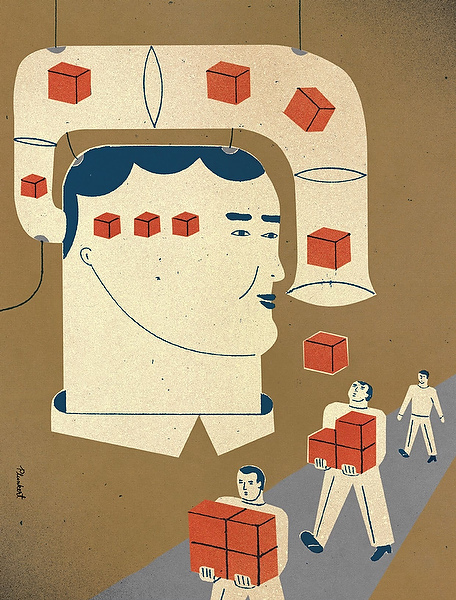 "The program trains people, empowers them, gives them a sense of how to overcome challenge... The emphasis goes beyond the classroom to experiential learning, a vital component." Alex Smereczniak (’14), formerly of Red Wing, Minnesota, graduated with a finance degree, an entrepreneurship minor and a tidy profit from buying and running Wake Wash, a laundry and dry-cleaning delivery service. A class-project team had created the business in 2007 with $40 and 15 customers. 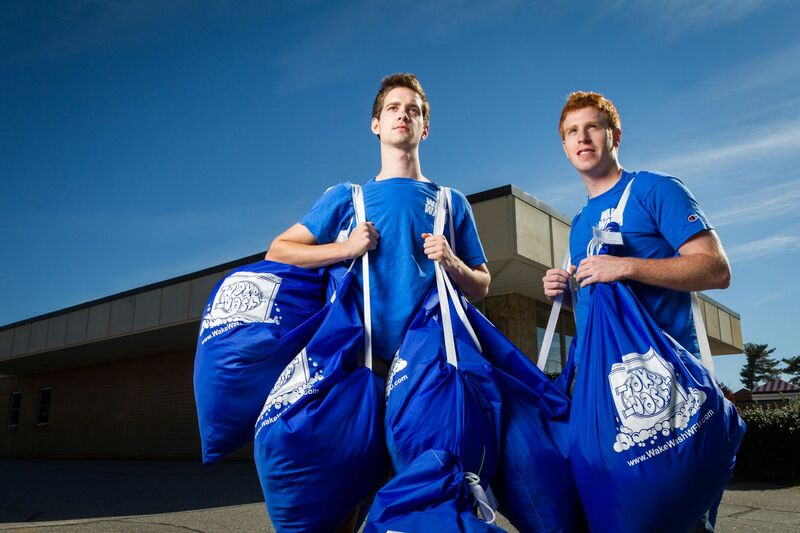 Alex Smereczniak (’14) and Quentin Robert (’14) are third generation Wake Wash owners. Smereczniak and three partners bought the business in 2012 for about $50,000 plus revenue sharing. They bought out one partner a few months later. Smereczniak and his other partners — Quentin Robert (’14) of Switzerland, a mathematical economics major and entrepreneurship minor, and Tyler Leung (’14) of Hong Kong, a double major in enterprise business management and Chinese — sold the business in 2014 to the next generation of entrepreneurs. The company was valued at six figures, contributing to a 300 percent return on investment. “The program sent us resources on writing contracts and provided good mentoring along the way but gave us the freedom to learn and do it on our own, which is key to getting the full learning experience out of it,” Smereczniak said. By the time Smereczniak graduated he had soap in his veins and Wake Wash had new services, an exclusive University contract and about 200 customers. Smereczniak is staying connected by working on re-creating the business at other regional universities. He has the support of his supervisors at Ernst & Young in Charlotte, where he works on a consulting team that improves business processes at financial institutions. All at age 23. J.T. 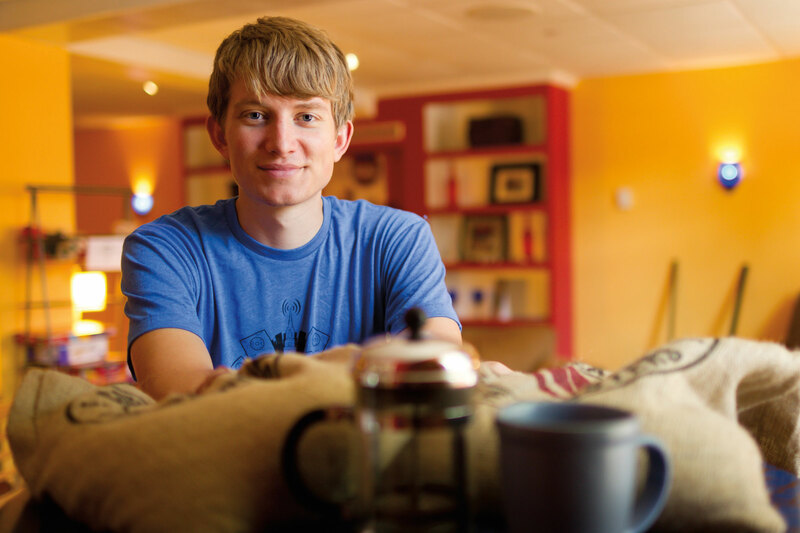 Peifer (’11) founded Feisty Goat Coffee in 2010. Not everyone has used the ICE program for a moneymaking venture. It has led to many nonprofit efforts: a charity to help underprivileged students in the Philippines reach college, a social networking site to create a virtual and real-world community for chronically ill hospital patients and an online auction site where students can bid on athletic gear donated by student athletes, with the proceeds going to charity. Pro Humanitate is in full bloom. First-year student Jorge Fournier Ruiz-Cadalso of Guaynabo, Puerto Rico, is eager to become the next success story. In his first week on campus last fall, the freshman wandered by accident into an ICE open house in Reynolda Hall. He was excited. He already had several business ideas. He knows he is a born entrepreneur. By first grade, he was selling things “because I wanted to be able to buy candy.” He said he bought chewing gum at Costco and sold it by the stick at school. On a trip to Turkey in the fourth grade, he paid $10 for 80 spinning tops on the street and sold them back home for $1 each. As president of his high school student government, he found that the cost of imported promotional items was limiting the group’s fundraising. Pens cost $1, and the clubs would sell them for $2 each. Ruiz-Cadalso called manufacturers and found that he could buy customized pens for 33 cents apiece. He set up a website (4nispromo.com) to take orders and benefit small businesses in Puerto Rico. He plans to major in finance. “My main objective is to make an impact in the world, to make our world a better place and to be an example for future generations,” he said. That’s just what he’ll find in the ICE program. 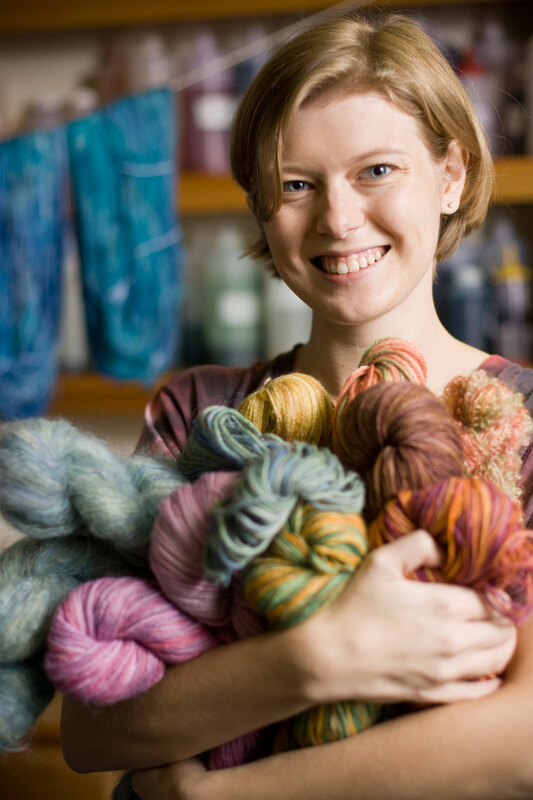 Laura Bullins Lough (’07) started her yarn business, The Unique Sheep, as a student. Students learn how to push a project in the real world, Black said, but in an environment with a safety net. “Many of them say, ‘I feel so differently about taking on my life, my career now as a result of going through this … I never would have taken this on,’ ” Black said. Funding, internships and mentoring come from the advisory council, composed of friends, alumni and parents who see the value of creative thinking in any endeavor. The ICE program is housed in the Office of Personal & Career Development. YUQING “RENEE” YE, a junior and computer science major developing a Chinese social network for people in creative industries such as media, photography, video and filmmaking. MORIA LAWLOR, a senior and sociology major who produces and sells handmade necklaces with 40 percent of proceeds going to research a cure for Cerebellar Ataxia, a rare brain disease with no known cure. NIKOLAI HLEBOWITSH, a senior and economics major who proposed a data analytics consulting firm focused on delivering quality data analysis to Charlotte and Winston-Salem companies for effective targeting of a certain demographic. WILLIAM ZANDI (’14), a philosophy major who sought a grant for his Students Helping Students nonprofit founded in 2005 to reallocate educational supplies and furnishings between affluent and hard-pressed primary and secondary schools. ANDREW WALSH (’14), an English major, and ROHAN WIJEGOONARATNA (’14), a psychology major, sought funding for a documentary about the electronic dance music industry that would be sold to other networks. Carol L. Hanner, former managing editor of the Winston-Salem Journal, is a writer and book editor who lives in Winston-Salem.